This poster is quite something. An illustration with caricatural overtones that wouldn’t be out of place in the poster for a broad comedy. Morgan Spurlock looking a lot like a crazed Lawrence of Arabia. All in that the service of a documentary dealing with a pretty serious topic. 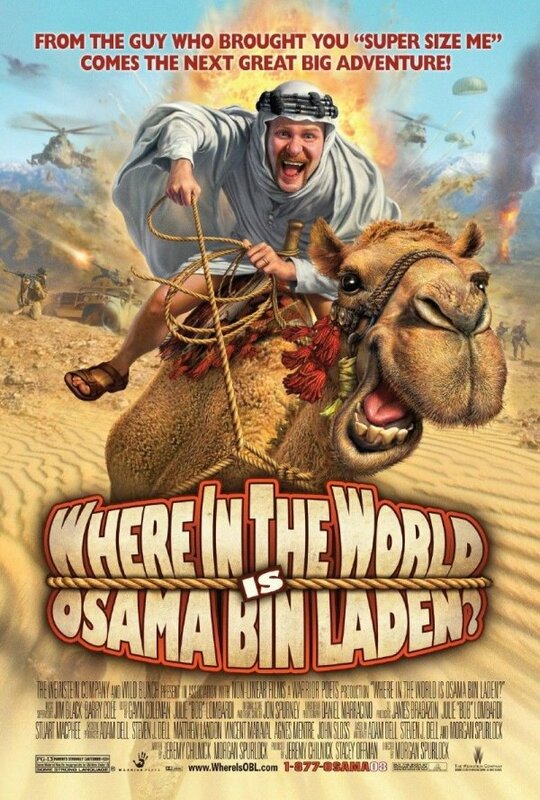 In many ways this poster is an offspring of the poster’s for Michael Moore’s movies, both for the equally irreverent and confrontational take on a serious subject and for putting the director at the center of the campaign. But it goes considerably farther than those posters did, and even farther than the last poster did, to the point that the documentary aspect seems to be almost completely lost. The war going on in the background keeps this from looking like a poster for a zany comedy, but not by much. I’m a little torn about this. I think there is no reason that we can’t have documentaries that give a thoughtful view on important subjects but that are also entertaining. But this poster seems to be selling the entertainment aspect exclusively, and I worry that we are crossing into a realm where we don’t care if the documentary has anything interesting or insightful to say, as long as we have fun watching. Then again there are plenty of fiction movies that are like that, and I don’t have a problem with them. Also, the advertisement is not the movie, so maybe I’m just being silly.